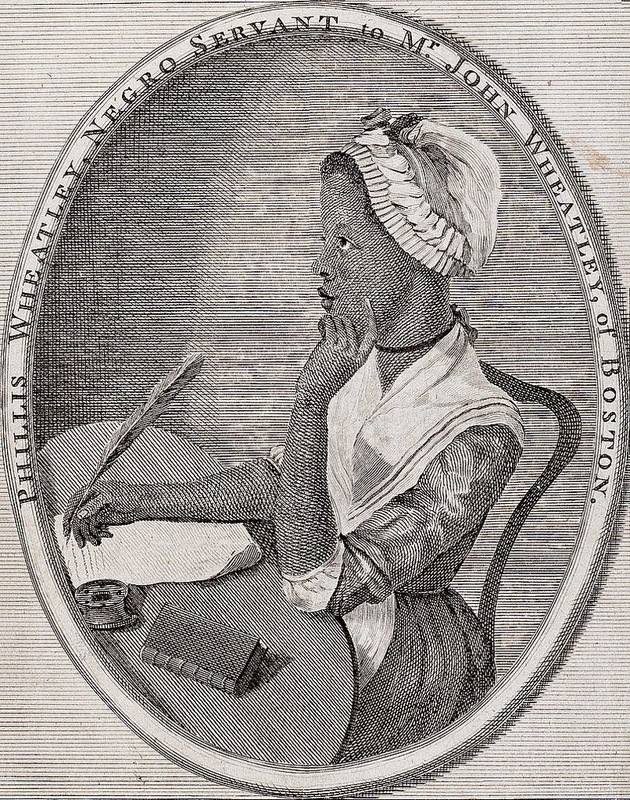 Phillis Wheatley (1753 – 1784) was both the second published African-American poet and first published African-American woman. Born in West Africa, she was sold into slavery at the age of seven and transported to North America. She was purchased by the Wheatley family of Boston, who taught her to read and write, and encouraged her poetry when they saw her talent. The publication of her Poems on Various Subjects, Religious and Moral (1773) brought her fame both in England and the American colonies; figures such as George Washington praised her work. During Wheatley's visit to England with her master's son, the African-American poet Jupiter Hammon praised her work in his own poem. At the age of eight, she was sold to the wealthy Boston merchant and tailor John Wheatley, who bought the young girl as a servant for his wife Susanna. John and Susanna Wheatley named the young girl Phillis, after the ship that had brought her to America. She was given their last name of Wheatley, as was a common custom if any surname was used for slaves. The Wheatley’s eighteen-year-old daughter, Mary, first tutored Phillis in reading and writing. Their son Nathaniel also helped her. John Wheatley was known as a progressive throughout New England; his family gave Phillis an unprecedented education for an enslaved person, and for a female of any race. By the age of twelve, Phillis was reading Greek and Latin classics and difficult passages from the Bible. Recognizing her literary ability, the Wheatley family supported Phillis' education and left the household labor to their other domestic slaves. The Wheatleys often showed off Phillis' abilities to friends and family. 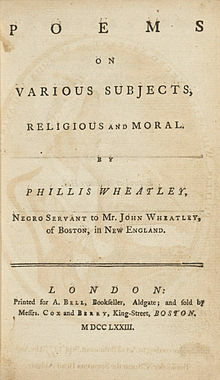 Strongly influenced by her studies of the works of Alexander Pope, John Milton, Homer, Horace and Virgil, Phillis Wheatley began to write poetry. Historians have commented on her reluctance to write about slavery. Perhaps it was because she had conflicting feelings about the institution. In the above poem, critics have said that she praises slavery because it brought her to Christianity. But, in another poem, she wrote that slavery was a cruel fate. Wheatley was emancipated after the death of her master John Wheatley. She married soon after. Two of her children died as infants. After her husband was imprisoned for debt in 1784, Wheatley fell into poverty and died of illness, quickly followed by the death of her surviving infant son. 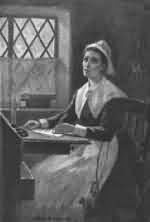 Anne Bradstreet (1612 – 1672) was the most prominent of early English poets of North America and first female writer in the British North American colonies to be published. Her first volume of poetry was The Tenth Muse Lately Sprung Up in America, published in 1650. It was met with a positive reception in both England and America. Due to her family's position, she grew up in cultured circumstances and was a well-educated woman for her time, being tutored in history, several languages and literature. Both Anne's father and her husband were instrumental in the founding of Harvard in 1636. Two of her sons were graduates, Samuel (Class of 1653) and Simon (Class of 1660). Nor ought but love from thee, give recompense." This part of the poem above lets out the logical argument and starts to become truly heartfelt with the use of religious imagery and metaphors. The subject of this poem is her claimed love for her husband as she praises him and asks the heavens to repay him for his love. Bradstreet wrote this poem as a response to her husband's absence. In October 1997, the Harvard community dedicated a gate in memory of her as America's first published poet. The Bradstreet Gate is located next to Canaday Hall, the newest dormitory in Harvard Yard.